Stress relief contacts ("Sliding Contacts") are designed to simplify connection to the V100 and V100B bead pins. In use, the installer slides the contact over the bead pin and then attaches the tab to the circuit trace. 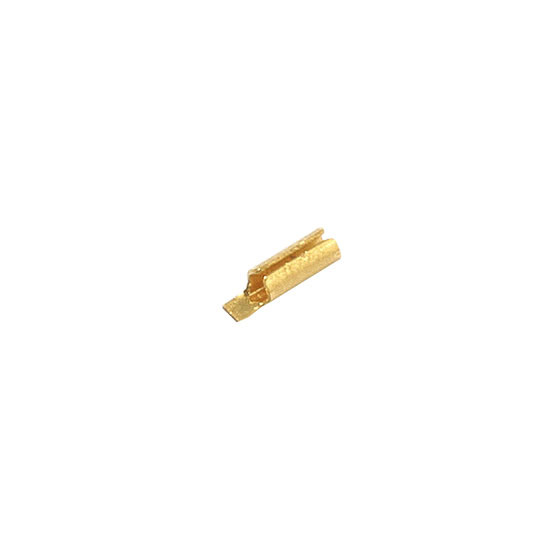 V110-1-R is designed to connect to a 0.15 mm microstrip trace on Alumina. The installation note for the V110-1 shows how to make connections using parallel-gap welding, wire bonding or soldering. Anritsu sells a step drill kit, 01-308 which allows a machinist to create all the required concentric holes for bead installation using only one tool. The kit also includes a tap to thread the hole to accept a V102F or V102M spark-plug connector. The V110-1-R is RoHS compliant. It contains less than the Maximum Concentration Values (MCVs) for Lead, Mercury, Cadmium, Hexavalent Chromium, PBB and PBDE per EU directive 2002/95/EC. The following RoHS exemption applies: Lead as an alloying element in copper containing up to 4% (40000PPM) lead by weight.